Immigration and Customs Enforcement (ICE) has been deporting over a million people each year. Most are Mexican citizens residing here without legal status. But thousands of those being detained and even deported are US citizens. This sounds unbelievable, and it should. ICE has no authority over US citizens. Nonetheless, a systematic examination of thousands of individual case files for detainees in southern Arizona between 2006 and 2008 revealed that just over one percent were deemed US citizens by an immigration judge. Almost all were held for more than two months. Even more shocking are the several thousand of US citizens each year who are not only detained, but also deported. This occurs either because of ICE bullying, a fear of indefinite detention, or because the US government gave their US citizen parents, mostly of Mexican ancestry, incorrect information about their legal status and issued them green cards instead of telling them they were US citizens at birth. Mark Lyttle, 32, a US citizen born in Salisbury, North Carolina can attest to all of this. On December 19, 2008 he was forced to walk across a bridge from Hidalgo, Texas to Reynosa, Mexico. Last week I received Mark's "alien file" maintained by the Department of Homeland Security. Among dozens of documents revealing the incompetence and even treachery of ICE, Customs and Border Patrol agents, and an immigration judge in Atlanta are ones triggering a series of events resulting in Mark's four month journey through five countries in Latin America. On August 27, 2008, according to a guard at the Neuse Correctional Institute, "five or six ladies who do the admin intakes" would have been typing into the North Carolina Offender database vital statistics for the approximately 60 inmates they were screening that day. The Neuse officer describing these procedures said the prison's job is alerting ICE to possible alienage but not making a final determination. After all, immigration status is the province of federal immigration agencies, not state prison employees. Upon learning that ICE issued an administrative removal order for someone Neuse had incorrrectly characterized as born in Mexico, the officer said, "I don't understand how ICE did this. They're the ones who are supposed to check this." On September 2, 2008, Mark signed an affadavit stating that his name was Jose Thomas and he was born in Mexico. The document's information is handwritten by ICE agent D. Faucette. "Jose Thomas"-s mother is named as Jennie Lyttle (his mother's name is Jeanne) and his father is named as Thomas Lyttle - deceased. The man who was swearing that his name was Jose Thomas and he was born in Mexico signed the statement: "Mark Lyttle." Mark does not speak a word of Spanish. This was the solitary legal document attesting to Mark's alienage on which ICE relied when issuing Mark's "Final Administrative Removal Order" on September 5. ICE also had Mark's FBI record designating his citizenship as "UNTD STATES AMERICA." And ICE had Mark's social security number. The false information that might justify removal was construed as factual and the accurate information indicating US citizenship was ignored. So was the information about Mark's long history of mental illness. Q. Do you remember why you were ordered removed in December 2008? A. I talked to an ICE officer and I asked her how Mexico was and to put me over there just to see how it was. She made up some kind of paperwork to make it look like I was from there. Q. Did you ever tell the ICE officer you were from Mexico? A. I never told her that. Mark has a history of mental illness, which also was indicated in the criminal records ICE possessed. 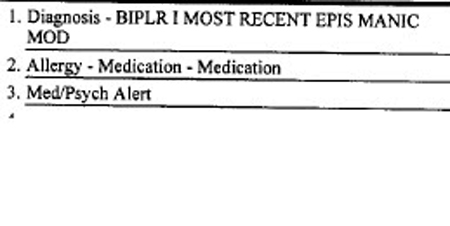 Indeed on December 17, 2008, an ICE health inspector evaluating Mark just before he was put on a plane to Mexico noted Mark was Bipoloar I - Manic. According to WebMD, Bipolar I disorder is a "form of mental illness. A person affected by bipolar 1 disorder has had at least one manic episode in his or her life. A manic episode is a period of abnormally elevated mood, accompanied by abnormal behavior that disrupts life." Mark may have had a manic episode of wanderlust in September, but in November, after being sent to a detention center in Atlanta, he had recovered and signed a sworn statement on November 3, 2008 stating he was born in the United States and a US citizen. ICE, however, maintained the delusion that the inconsistent and, frankly, goofy statement of Mark's alienage was authentic and claimed that the more credible and easily verifiable evidence of his US citizenship was false. When I told Mark's attorney, Neil Rambana, that ICE had Mark's FBI record indicating he was a US citizen, Rambana was furious, "That is the most dangerous precedent I have ever heard. Someone swept a whole heap of dust under a carpet because they didn't want to do their job. These things are easily identifiable by those who have superior resources, but they failed to exercise an iota of effort." Mark is adopted, as are millions of other US citizens. This posed no hurdle to Marie Alvarado Vice-consul for the US Embassy in Guatemala City who called Mark's mother, obtained his adoption papers, and arranged for Mark's US passport in a few hours: "His story made sense, especially because of his history in a mental institution." She added that it took some "leg work," but "it wasn't a mysterious case." According to ICE Public Affairs Officer Barbara Gonzalez, the agency believes that the decision by William Cassidy in Atlanta to deport Mark validated ICE's findings. Cassidy, like many so-called immigration judges, runs a kangaroo court. His behavior hasprovoked formal and informal complaints. And he has consistently ignored the instructions in the Immigration Judge Benchbook pertaining to the treatment of respondents who lack attorneys. ICE has not indicated any concern about its agents deporting Mark and is not conducting an investigation. Gonzalez said, "The review of the case shows that the officers executed a removal order issued by an immigration judge, so to my knowledge, there is no investigation into the matter." Of course the removal order was only issued after the ICE agents gave the judge false information. When ICE presents sworn statements by their agents affirming the factually inaccurate narrative of a mental patient, and ICE ignores government records and sworn statements from the same individual that are factually accurate, and thus compiles a record prompting a judge to deport a US citizen, ICE thinks it has done its job. On July 6, 2009 I asked Gonzalez: "Is it ICE policy that a sworn statement to alienage be considered evidence of alienage and a sworn statement of US citizenship be disregarded? This is a fact pattern in many cases of US citizens being deported and I consider it a very important policy question." As of Wednesday she was still working on a response. Mark is living in a group home in Virginia. We speak regularly. Mark's comments a couple of months ago seem especially apt: "They're supposed to be professional but they screwed up. The judge is going to look at it and say, 'You knew all this and you still deported him? You're crazy.'" How to stop this? ICE and the Department of Justice assumes everyone in detention is an alien and does not afford them the rights of US citizens. This is wrong for legal residents who are also unlawfully deported and it is obviously unconstituional and illegal to do this to US citizens. The solution? Pro bono attorneys must be available to the legally fragile population of detainees, many of whom are thousands of miles from families who are not told of their location. If the US government will not pay for this, then it needs to close the detention centers. The daily violation of the most sacred right a US citizen has, the right of citizenship itself, including at minimum the right not to be kidnapped and made stateless by one's own government, must stop.